The destination path is displayed towards the top of the program center window. It can be a local path, a network path or a directory on an FTP server. Click on the button on the right of the entry field to select a directory anywhere on your computer or on your network or edit the path manually. Clicking the down arrow at the right of the entry field will drop down a list of recently-used destination directories for quick selection. Right-clicking this field will open a menu for editing this list. It is also possible to insert placeholders for date and time into the path and to replace the drive letter with the volume name of a removable drive (e.g. a USB stick). If you need a special account to access the destination directory, click the button and enter the username. If also a password is specified, this will be encrypted and saved in the task file. The connection to the backup directory will be made automatically. If no password is specified, the user will be prompted to enter the password for each backup. When using USB sticks or external drives as backup destination, the system may not always assign the same drive letter. To be independent from drive letters when backing up data, you can use the volume specifier of the removable media (:<volumename>:) instead. On backing up, the program will check whether a medium with the specified volume name (regardless of the assigned drive letter) is connected. If not, the user will be prompted to insert it. If you select a destination on an FTP server, the server's name, port and the remote directory are displayed. Click the button at right to specify or edit the required connection settings. The destination directory may contain one or more placeholders for date and time. 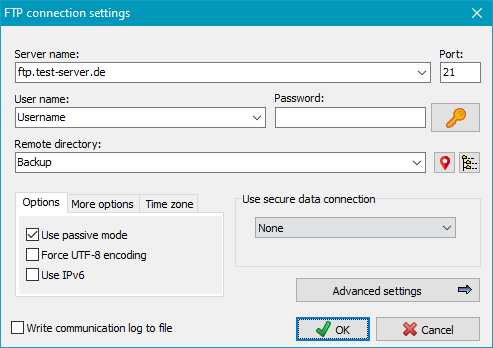 If a password is specified in the dialog, the connection to the FTP server will be established automatically. If you leave the password blank for greater security, you must insert it manually before each backup. None: All data will be transferred unencrypted. If available (explicit): On connecting, the server will be interrogated as to whether it supports TLS/SSL. If so, the data transfer will be encrypted (explicit method), otherwise unencrypted. Require (explicit): It is expected that the server supports TLS/SSL (explicit method). If not, the connection will be canceled. Always (implicit): All data transfers will be encrypted using the special port 990 (implicit method). If the server does not support this method, then connection will fail. For a secure connection the option Require is recommended. The FTP server must support one of the TLS versions 1, 1.1 or 1.2 (more infos). Use passive mode: Using passive mode, the server will define the port for data transfer, otherwise the client will define this. Force UTF-8 encoding: Some servers support a file transfers using UTF-8 encoding, but do not announce this capability after establishing the connection. This is inconsistent with the specification of RFC2640 Section 3.2 but in this special case you can force the encoding of the client side to UTF-8 by checking this option. If, in addition, the server must also be switched to UTF-8, use the option Send OPTS command for UTF-8 described below. Use IPv6: Some servers require a connection using the IPv6 protocol. Click this option to switch to the IPv6 address mode. The following options (see screenshot above right) are only required if problems arise from the FTP connection (see here). Unfortunately the available servers do not all follow the recommendations (RFCs) for the FTP protocol consistently. The following options are a workaround for these shortcomings. Send OPTS command for UTF-8: A server supporting UTF-8 must inform the client about this after establishing the connection and automatically switch to this mode (see RFC2640 Section 3.2). Unfortunately there are servers indicating the support of UTF-8, but nevertheless requiring an OPTS command to enable it. If this is the case, this option must be selected. Force EPRT/EPSV for IPv6: If the connection to the FTP server was established using the IPv6 protocol (see above), the data transfer usually requires the EPRT and EPSV commands, instead of PORT and PASV used for IPv4. By default, the server should inform the client about this in reply to the feature request (FEAT command). Unfortunately there are servers that do not follow this recommendation. If this is the case, you must switch over to this manually by clicking this option. Use HOST command: Many Internet providers use the same FTP server IP for all users. The HOST command is used to assign the user's server space. On time-zone spanning FTP connections it is sometimes necessary to adjust the time offset manually for reliable timestamp comparisons. For debugging purposes, communication with the FTP server can be logged. This option will not be saved permanently. The log is written into the file PbFtp.log located in the same directory as the other log files (see here). Use the Action menu to view or delete this file. Clicking the Advanced settings button will open the following page. Change to lower/upper case: Unix/Linux systems differentiate between lower- and upper-case characters in filenames. You can specify whether you wish to change all file and directory names to lower or upper case prior to data transfer. Allow quoted filenames: Filenames with spaces will cause errors on an FTP transfer. Some servers allow filenames within quotation marks (as is common under Windows). Character encoding: As there are still FTP servers that do not support UTF-8 encoding, you can specify that certain characters are to be replaced by a numeric code as is usual in URL addresses (e.g. a space = %20). 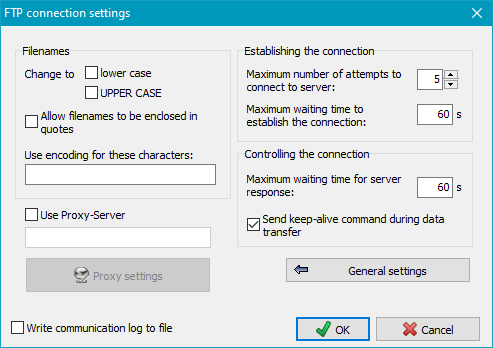 Use Proxy server: If a proxy gateway is required to connect to the FTP server, you can specify the desired settings here. Maximum number of attempts: Specify the maximum number of attempts to connect to the FTP server. If this fails, the backup will be canceled. Maximum waiting time to establish the connection: Specify the maximum time to wait for a reply from the FTP server after sending the connect command. If establishing the connection fails, further attempts will be made until the maximum number is reached (see above). Maximum waiting time for server response: Specify the maximum time to wait for a response from the FTP server after sending a command. Send keep-alive command during data transfer: With some FTP servers or firewalls it can happen that during lengthy data transfers the control channel will be closed due to inactivity. Enabling this option, a small data packet will be sent periodically to prevent this issue. You can find more information about FTP on Wikipedia. %dow% - day of current week in the format "Mon, Tue, Wed, Thu, Fri, Sat, Sun"
%ldow% - day of current week in the format "Monday, Tuesday, etc." %lmonth% - name of the month in the format "January, February, etc." 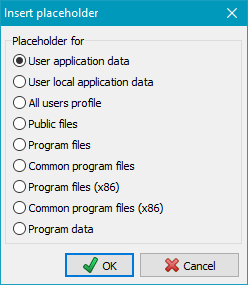 Placeholder for Windows environment variables: In addition you can use any Windows environment variable as part of the destination path. Insert the placholder %evar(<name>)% manually. The expression inside the brackets (<name>) should be replaced by the name of the environment variable, e.g. %evar(HOMEPATH)% or %evar(TEMP)%. Hence another backup directory will be generated each day. Next, select the directories to be backed-up. Click on the Directories tab and select the desired directories you wish to back up. If you select only one directory, it will be displayed in the upper field and can be added directly to the task by clicking the button. If you select more than one directory (possibly from libraries), after clicking the button these will be displayed as a list prior to being added to the task. You can check and optionally deselect individual directories. A click on the OK button will add the directories to the task one after the other. If you wish to inspect the files contained in the selected directory, click this button. The dialog box option Show files allows you to display a file list, but you can select only one directory. From version 5.8.5, you can directly select one or more files from a directory for backup. Although this was possible with earlier versions, some manual adjustment of the required filters was necessary. The current version will perform this automatically. Clicking the button will open a dialog to select one or more files to be backed up. The directory containing these files will be added to the backup task, all subdirectories will be excluded from backup and the required file filters such that only the selected files will be backed up. The names of all selected directories will be added to the task list in the center. Long names will appear abbreviated in the task directory list such that the beginning and end of the path will remain visible. Moving the mouse over a such a name will display the full path as a tooltip. 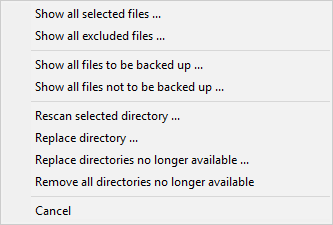 The checkbox on the left can be cleared by clicking to exclude the selected directory from backup temporarily without removing it from the list. If you wish to resume the backup for this directory just click the checkbox again. (-n): There are n subdirectories excluded. (+n): There are n subdirectories selected. (all): No file filter has been specified. 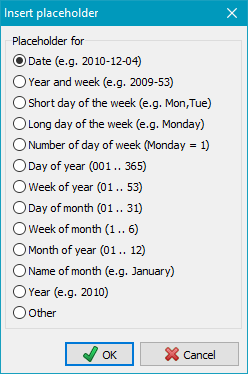 (from/to date): A time slot has been specified under the Files tab. (</> size): Only files matching a predefined size (e.g. <16MB or >1kB) will be backed up. [+/-attr]: Certain attributes (e.g. [+a-r]) will be included or excluded. [I]: A type list has been specified via the option "Only these" under the Types tab. [E]: A type list has been specified via the option "All except" under the Types tab. Clicking one of the listed directories will display the tree of all subdirectories or, dependent on the user's selection, the file filters or file types in the program bottom window (see more). Doing this click for the first time after opening the task, will additionally scan all these subdirectories for new and changed files and update the display for file count and volume. On loading a task or clicking one of the listed items, the program will check wether the associated directory still exists. For example, it could have been deleted or renamed in the meantime, or is a disconnected external drive. Such a directory will be disabled in the list and displayed in gray. To prevent the selection settings from being changed, it is no longer clickable. As soon as the directory becomes available again, the item will be reenabled automatically. If you want to remove from the task all directories no longer available, use the item from the associated context menu. Clicking the left button will rearrange the directories to be backed up into an alphabetical order. Clicking one of the other buttons will move the selected entry one row up or down. If you want to back up files from a removable drive (e.g. a USB stick) you cannot be certain that the same drive letter will always be assigned. In such a case, using file synchronization on backup may result in loss of data in the backup directory. To prevent this, the program saves the volume name (if assigned) with any directory to be saved and located on a removable drive when creating a new task. So it is strongly recommended to assign a unique volume name to any used removable drive. Right-clicking on a drive in for example Windows Explorer and selecting Properties will allow you to do so. Before a backup starts, the program checks whether this drive is present. If not, the backup will be canceled. Note: If the backup method is set to Separate directories for drives, the name of the root directory at the destination will be generated from the volume name (e.g. G:\Backup\Daten-1\..) instead of using the drive letter (e.g. G:\Backup\DrvK\..) as applied for fixed drives (see more). To remove a directory from the task list, click on the button. Optionally, also all files backed up from this directory can at the same time be deleted from the backup task destination. Show all selected files: Show all files that are selected for backup using the current filter settings. Which of these files really will be backed up will be decided later, on performing the backup. Show all excluded files: Show all files that are excluded from the backup using the current filter settings. Show all files to be backed up: This item is only available if solely files with the archive bit set should be backed up. All these files will be displayed. Show all files not to be backed up: This item is only available if solely files with the archive bit set should be backed up. All files with this bit not set will be displayed. In most cases you can use the default settings for a backup, but the more experienced user may prefer to configure the many individual options. Backup destination: In separated files or in zip file(s). Backup mode: Update (using timestamp or archive bit) or configured as an alternating schedule (full and differential or incremental). File processing: Copy as-is, or use compression and/or AES encryption. Options: Copy alternate file streams, document summaries, file permissions, verify backed-up files, etc. Synchronization: Delete from the backup destination files that no longer exist at the source. Security backup: Older versions of files are renamed instead of being deleted (with a definable number of previous versions). Mail delivery: Automatic mail delivery after backup with status and optional log. External programs: Execute any external program or script before and/or after a backup. There can be many different reasons for errors that arise during a backup. 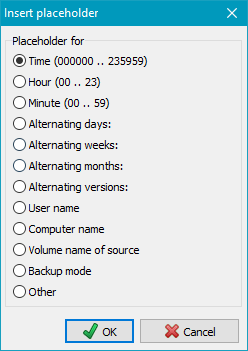 After each backup, the status windows will display whether errors occured and how many. Detailed information about errors will be found in the log file. If a file could not be copied due to an error, its previous version will in any case be retained at the destination. To accelerate the loading of a task, the number of files, the required storage capacity and the type list for the selected directories are not all updated immediately. By default, only the first directory will always be scanned for new files. You can uncheck the option Scan directories in the dialog called from Preferences ⇒ Program start ... in the main menu to disable any scan after opening a task. In this case, a scan is started not before one of the directories to be backed up is left-clicked. Load a saved task (.buj file) for editing or execution. Clicking this button will open the task menu that contains a list of up to 15 of the most recently-opened tasks. Click within the list to load a task. Right-clicking the icon will allow the list to be edited. You should save your backup tasks to disk for future use as a file with the extension .buj. When starting the program for the first time, a task directory is created at "My Documents\PersBackup". You can change this location using Preferences ⇒ Directories in the main menu. The backup tasks are saved as readable ASCII files, but modifying such a file manually with a text editor is not recommended. 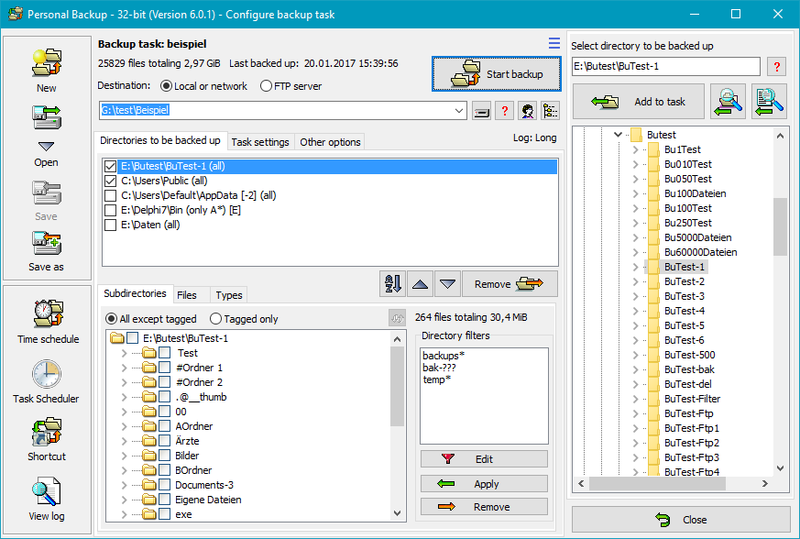 Instead, edit the task within the "Personal Backup" program. Note: provided that a task has not been changed, this button will remain grayed out. An existing or edited task can be saved under a new filename. Over time, more and more tasks for backup, restore, cleanup and verify will be accumulating. They are stored in the task directory as files using the extensions buj (Backups), rsj (Restores), cuj (Cleanups) and vfj (Verifications). By clicking the Delete ... function in the menu any of these tasks can be deleted. 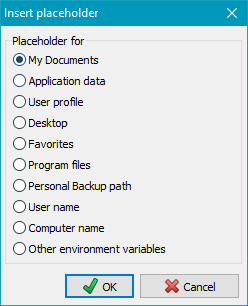 At the bottom right of the file selection dialog, you can specify the type of the affected task and then select the file. Associated entries in the task lists will be removed as well. The directories of an existing task can be added to the list of directories of the currently-opened task. The selected directory in the task list will be saved as new task. Verify backup ... - Using the settings of the currently opened backup task a guide, the dialog for backup verification will be displayed. You can edit the settings and start the verification of files. Edit scheduled task - Select a backup task performed by Windows Task Scheduler and edit the schedule. for current task ... - Create a shortcut to the currently-opened backup task on the computer desktop. Double-clicking this shortcut will immediately start the backup. 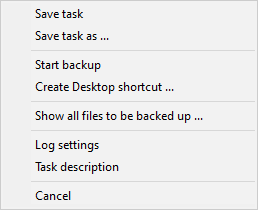 for several tasks ... - Create a shortcut to several selected backup tasks on the computer desktop. Double-clicking this shortcut will automatically perform these backups one after the other. 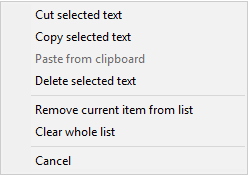 A right-click on certain areas of the desktop opens one of the following context menus. Cut selected text - The marked text in the destination field will be copied to the clipboard and then deleted. Copy selected text - The marked text in the destination field will be copied to the clipboard. Paste from clipboard - Text from the clipboard will be inserted into the destination field. Delete selected text - The marked text in the destination field will be deleted. Remove current list item from list - The selected destination directory will be removed from the internal list of recently-used directories. Clear whole list - The internal list of recently-used directories will be deleted entirely. Area "Directories to be backed up"
Show all files to be backed up ... - This item is only available when only files are to backed up having the archive bit been set or the backup is made to zip files. Show all files not to be backed up ... - This item is only available when only files are to backed up having the archive bit been set or the backup is made to zip files. Rescan selected directories ... - The selected directory will be scanned to update file count and volume. Replace directory ... - The directory selected to be saved will be replaced by another. The new directory can be selected using a dialog. All other settings for this entry will remain unchanged. This option can also be used if the name of an external volume has changed. The directory entry will be updated automatically. Replace directories no longer available ... - Directories not available when loading the task (because they have been deleted or renamed, for example) are disabled and displayed in gray. Select this menu item to replace them by other existing directories. All other settings for these entries will remain unchanged. Remove all directories no longer available - Directories not available when loading the task (because they have been deleted or renamed, for example) are disabled and displayed in gray. Select this menu item to remove them from the currently-loaded task. Show files of subdirectory ... - All files located in the selected subdirectory will be displayed. This is very useful for checking whether there are any files that should or should not be backed up. Add to task -The selected directory will be added to the backup task. Update - Update directory tree.